Short Answer: Yes. Get this done this month! HTTPS is the secure version of HTTP. It reflects that your website has a SSL Certificate. This might seem like a hassle and yes there is an additional fee. It’s been fine to put this off until about July of 2018. But now – you basically NEED to have it. Why? HTTPS has become a ranking factor. It’s also a component of Google prioritizing security and trust in 2018. We’re urging all of our client websites to update this. We just did this for our own website. 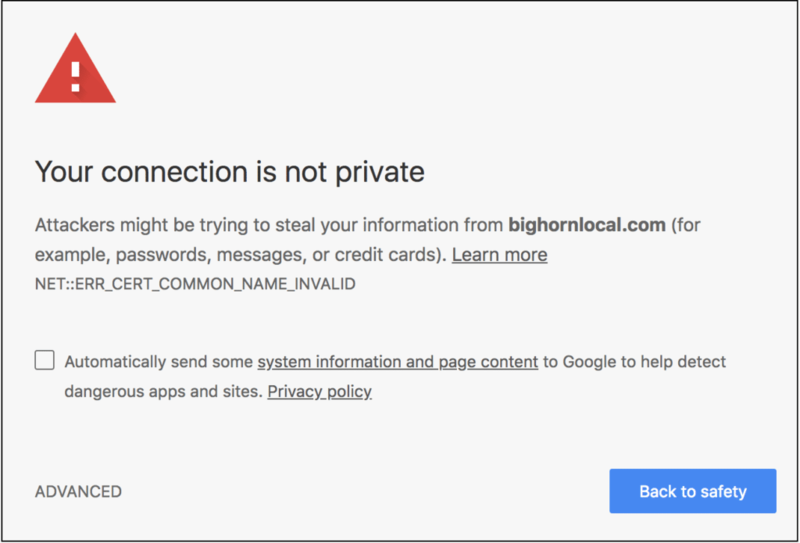 In July, Google Chrome started display “Not Secure” alerts in the address bar for all websites without SSL Certificates. This alert could have far-ranging effects on your website’s reputation and could decrease traffic and sales and trust. Not Secure warnings can be frightening. Take a look at what ours looked like on my phone last month! “Back to Safety”?!?! Wowza. That’s not the User Experience we’re going for! Google may also prioritize secure pages in search results. The impact of this might be hard to detect, but we’re talking about following all the Google best practices so they trust your website and rank it well. Right? HTTPS shows that you are paying attention, doing the right thing, and on top of your stuff. Those competitor websites that don’t have HTTPS will gradually move down the rankings. There may be some costs associated with this since some hosting companies charge you a flat fee or annual fee. And some folks might be taking advantage so don’t spend a ton of money. This process might take 1 to 2 hours to complete. However it also might open a can of worms if your website has not been regularly updated recently. If you need help or have further questions, give us a call. We’ve got solutions for you. And we’re also happy just to give you our opinion on your situation.